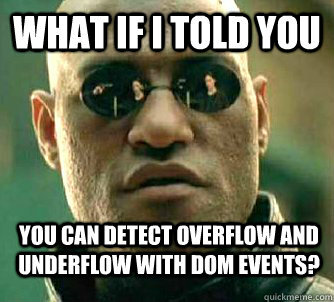 To level-set, I’ll define and describe what overflow and underflow are in the context of the web. Overflow is a rather simple concept you’re probably familiar with: when an element’s content takes up more space than it allows, given style or box model constraints, it causes a scrollbar to appear or the content to be cut off from view (if you set overflow: hidden;). 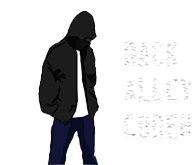 Underflow is the less common case you probably don’t think about: an element currently in an overflown state leaves that state as a result of the element growing in size or a reduction of the amount of content within it – visually, the scrollbars disappear and all content is visible within the element. As it turns out, Firefox and WebKit browsers offer events that alert you of changes between these two flow states. Let’s Talk Flow Events, Boyee!